QUESTION: Mr, Armstrong; There are those who argue that the Fed caused the booms in the developing countries by lowering interest rates that resulted in them borrowing in dollars making the world now short the dollar and thus have enslaved the world to the dollar. Therefore, they claim that whoever controls the central bank of the reserve currency thereby controls the world. Do you think this was intentional? Thanks. It seems you are the only one without the soap-box. ANSWER: Are you really serious? This is the argument from rational people? That is like blaming Switzerland for creating a peg to ensure their exports would not decline so all the German, British, and Greek mortgages in Swiss francs is their fault and intentional. This is pure sophistry at its best delusional. The Fed lowered short-term rates to deal with the US economy not to influence other countries. The fact that other nations issued debt in dollars to save interest is somehow the design or fault of the Fed is brain-dead if not unimaginable. They have no proof of such nonsense. This is clearly conclusionary gibberish to support an unsupported conspiracy theory. Numerous bond issues were in British pounds that defaulted in 1931 as well as dollars. China issued bonds in foreign currencies to sell them. 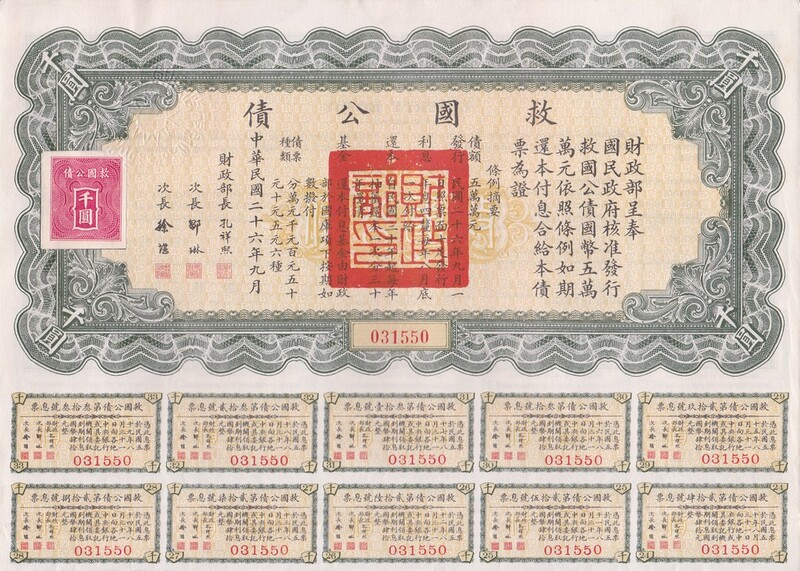 Here is a 1937 Liberty Bond denominated in $1,000 issued by China back then. This too was somehow inspired by the Fed? Issuing bonds in foreign currencies is standard by third-world nations. The bankers sell this idea to save money and always blow these nations up. 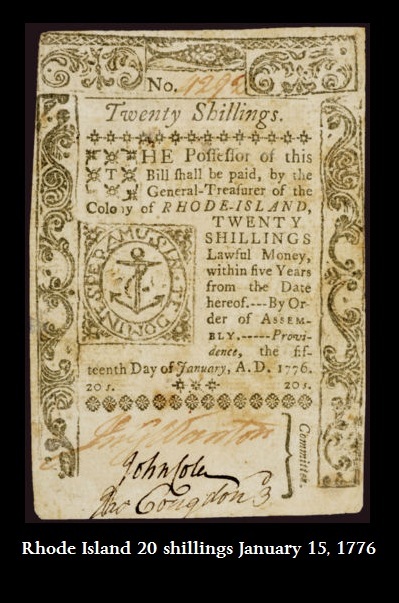 Even some of the earliest US currency was issued in British pounds. Here is a note denominated in shillings. This is the typical sophistry behind conspiracy theories that people make-up to hear themselves pontificate and they assume planned designs rather than accepting that just maybe everything is run by people who have no idea what they are doing. Blaming the Fed for third-world countries issuing dollar denominated debt is like blaming you for making a right turn and three cars back someone slams into the rear of the car in front of him for he slowed down because you were making the turn. This is the whole point of a independent reserve currency. When I say that the dollar is the reserve currency and that subjects the world to American domestic policy objectives, that is what I am talking about. The US loses the ability to manage its domestic economy if it has to worry about third-world countries issuing debt in their currency. That means DOMESTIC policies OBJECTIVES can be held hostage to INTERNATIONAL policy OBJECTIVES. That is why we need a reserve currency other than that of any single nation. Blaming the Fed for overseas problems is simply stupid and illustrates that such ideas are totally clueless since they are ignorant of grasping just how the world truly functions. « Who Controls the Money Supply – Fed or We the People?